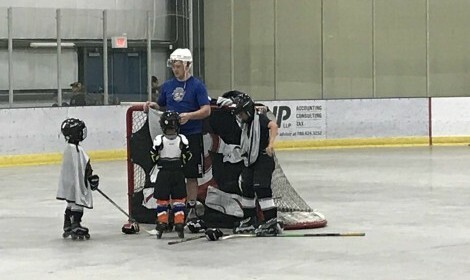 A dedicated group of Alberta Minor Roller Hockey volunteers at the invitation of a group of curious parents - hosted a learn to play clinic in Grimshaw Alberta on June 9th, 2018. Two players from the AB Pro Roller Hockey team, Spruce Grove Phantoms (Cole Sieben, Kyle Edwards) donated their time to AMRHA to run two skills clinics. The first was for nine, U10 players who were totally new to the game. The afternoon clinic saw 15, U16’s and one of the U10’s stay on for a second session. The older group were quick to pick up the intricacies of the game and break themselves into two teams for a game of shinny. The event was so successful Grimshaw is already discussing the possibility of further roller hockey activities for this year.